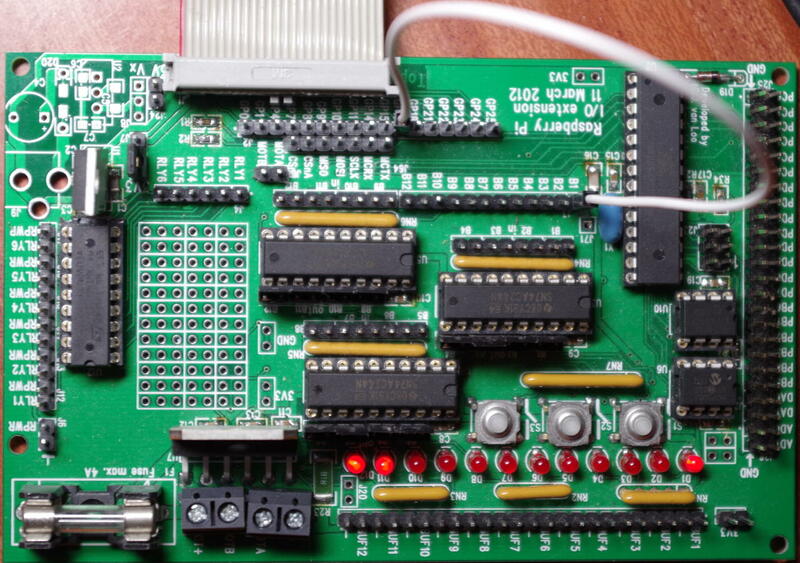 The Gertboard is a buffered IO interface board for the Raspberry Pi. It features 12 LEDs, 3 buttons, a high power motor driver, 6 open-collector medium power outputs, analog to digital and digital to analog converters and an ATmega 328p processor. These pages serve as a demonstration of using the Gertboard with the wiringPi library from the command-line, in BASH and C. There are several pages in this series and I hope they might act as a tutorial and possibly even an aid to making sure your Gertboard is fully functional. I have one of the early self-assembly Gertboards, but this applies to the later ones that are pre-assembled from Farnell. All these examples were tested using the standard Raspbian Linux distribution for the Raspberry Pi. If you are using a different distribution, then you may need to make changes, however most should work as-is. WiringPi is a set of C functions designed to make it easy for C and C++ programs to access the Raspberry Pi’s GPIO. There is also a utility program; gpio which you can use from the command-line to test simple GPIO operations. Get and install wiringPi. The instructions are here. There are several jumpers on your Gertboard. You should be familiar with them from reading the manual, but I’ll describe some of them here. The buffer Input/Output jumpers: There are 12 of these in 3 groups of 4, all adjacent to the 3 74×244 buffer chips. When a jumper is on the side of the chip nearest to the Raspberry Pi Connector, then the corresponding buffer is configured as an input from the “BufX” pin through the buffer IC in the Gertboard and and into the Pi. When it is in the opposite side, close to the LEDs and the “BufX” row of pins, then that buffer is configured an an output from the Pi through the buffer IC and to the LED and the “BufX” pin. The jumper bridge block: This is a block which forms part of the row of GPIO pins that are available for connection from the Pi into the Gertboard. A number of these (7) have the facility to bridge directly to Gertboard peripherals. These are the 2 serial lines from the Pi to the ATmega and the 2 SPI buses from the Pi to the Gertboards A/D and D/A converter chips. I would suggest leaving these removed for now – however we will use them later on, so keep them safe. The first thing we’ll do is set the jumpers for output and light up the first LED, after that we’ll move onto more complex examples. I do not recommend making this connection with the Pi turned on just in-case you put the cable on the wrong way, or off-by one pin, etc. Do check everything before turning it on. One thing to note: The inputs to the buffers are high impedance – what this means in practical terms is that if you touch one of the pins on the Pi side, then the LEDs are likely to light up. Sometimes just waving your hand near them is enough. While this isn’t generally a problem, it’s something you should be aware of. Note: That may only apply to early Gertboards – I’m told the later ones have pull-down resistors added to stop this effect. should turn it off. If that works, then congratulations! But if not… Then you first need to make sure it’s all wired up correctly and that the Gertboard is functioning correctly. The photo above is how it should be wired up to start with. If you do get this far, then we can move onto the next step which is writing some programs using the Gertboard and wiringPi. All the example programs here are part of the wiringPi software distribution, so if you have installed it correctly you shouldn’t need to do much typing!